Dr. Lindsey Elmore is a Pharmacist with a passion on everything oils and more. I saw this post from her on Facebook and thought that it was something I hadn't really thought of before. I know that your brain has a fantastic memory for smells but this info took that to a brand new level. If you want some excellent information, make sure you follow her. 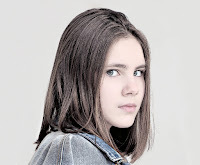 Click HERE for her page. I just love new things. Sometimes it is a new Easter outfit. Sometimes it is something big like a new car or house. Sometimes it is tiny like new earrings or sometimes something super simple like a new book. They all give me joy. 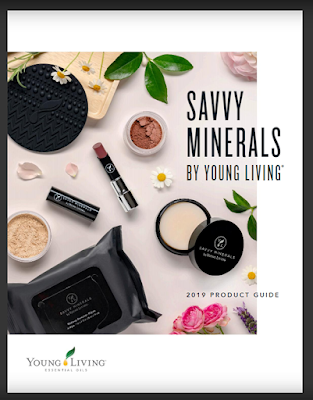 Well, today's joy is a couple of new products in the new Savvy Minerals by Young Living Makeup line. A new brush cleaner and a scrubbing pad to go along with it. Makes it so easy to give your brushes the proper care! Click on the catalog below! Thank you to Elizabeth Bailey who shares this! Does anyone else, start cleaning dishes and think about how dirty your sink might be? Umm, I do!! If you’re like me, I have the recipe for you! First, I take baking soda and sprinkle it all over my sink. Next I mix one capful of thieves cleaner with 4 cups of vinegar. I like to put this in a spray bottle and give it a good shake. I then spray the sink down and let it sit. After about five minutes, I scrub the sink and rinse it with warm water. I love using this at least once a week. It leaves my sink shiny and grease free. The first time I did this, I could not believe how dirty my sponge was. What do you intend to do on St. Patty's Day.......do you celebrate by drinking some green beer with your friends. OR, do you like some green eggs and ham with the kids in the morning. 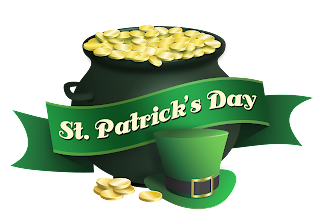 No matter what you do, make sure you wear a little bit of the green whether you are Irish or not or you may get pinched! Here is a special St Patty's Day offer for you as my part in spreading a little bit of the green! For anyone who purchases wellness, abundance and purpose with one of our Premium Starter Kits, I'm offering a St Patty's Day bonus!! You can take your pick of either Eucalyptus Radiata (perfect to support healthy breathing), or Citronella (perfect in sprays to keep summer annoyances away from your outdoor parties.) They both retail for about $25!! This offer is good until my available bottles are gone or until March 17th at 11 pm, whichever comes first. So, which kit would you like? The original Premium Starter Kit* features 11 essential oils AND a diffuser along with some wonderful samples. It is on sale until stock is gone and it sells for $144 (normally $160) plus tax and shipping. Select this one fast before it sells out! The updated Premium Starter Kit** features 12 essential oils AND a diffuser along with some samples that I know you will love. It sells for $165 plus tax and shipping. Choose which free oil you want with your kit and you have the ability to support wellness in all your body functions and feelings! Let me know which Premium Starter Kit you think you want and I'll get you started. I have limited amount of the two free oils (three Eucalyptus Radiata and four Citronella). Once they are gone, the free offer is gone! So, celebrate St. Patty's day with a little bit of green that will support your wellness WAY longer than a green beer or egg! *The Original Premium starter Kit contains the following 5ml oils: Copaiba, Lavender, Lemon, Frankincense, Peppermint, Thieves, Digize, Panaway, Citrus Fresh, Raven, and Stress Away. **The Updated Premium Starter Kit contains the following 5ml oils: Lavender, Lemon, Frankincense, Peppermint, Thieves, Digize, Panaway, Citrus Fresh, Raven, Stress Away, Valor and Peace & Calming..
Toxins are everywhere and they are also IN something most of you put into your mouth everyday. You brush your teeth everyday, but do you have any clue what toxins could be brimming on your bristles while you brush? Many toothpastes on the market include a host of harmful ingredients. You may not believe that a daily dollop of toothpaste could cause harm, but it adds up over time. It is estimated that the average person will use 20 gallons of toothpaste in their lifetime! Below are 7 Ingredients you want to avoid in your toothpaste. Today, 95 percent of all toothpaste sold in the U.S. contains fluoride, according to the Fluoride Action Network. However, too much fluoride can cause a condition known as fluorosis that discolors or spots tooth enamel and affects 41 percent of American adolescents, according to the CDC. When you consider that fluoride is added to more than 70 percent of the country’s water supply, suddenly we are dealing with a potential overdose. Opt for fluoride-free brands. Sorbitol, a liquid that keeps toothpaste from drying out, is a laxative that can cause diarrhea in children. Saccharin, another artificial sweetener, has been linked to bladder cancer, brain tumors and lymphoma in rodents. Instead, try stevia or xylitol as natural sweetener alternatives; the latter has been shown to also prevent tooth decay by increasing saliva, thus decreasing bacteria, in the mouth. Synthetic colors are derived from coal tar. Only seven colors remain on the FDA’s approved list; all others have been banned. Yellow #5 is under review due to links to hyperactivity, anxiety, migraines and cancer. If your toothpaste contains these, keep shopping. Originally used to clean floors, sodium lauryl sulfate is a detergent known to cause microscopic tears in the mouth (which can lead to canker sores). It’s an ingredient that makes toothpaste foam; look for glycyrrhizin as a healthier alternative. Derived from red seaweed, carrageenan is added to thicken toothpaste, but it’s been linked to gastrointestinal inflammation, ulcers and even colon cancer in laboratory animals. While food-grade carrageenan sounds safe, it’s also been linked to insulin resistance and glucose intolerance in mice. This is the main active ingredient in antifreeze and is used to soften cosmetic products. It has been linked to damage to the central nervous system, liver and heart. Triclosan is added to personal care products to reduce or prevent bacterial contamination. An FDA banon using it in body wash and soaps goes into effect Sept. 6. However, triclosan is still used in the Colgate Total line of toothpastes, according to Consumer Reports. Studies link triclosan to a decrease in thyroid hormones and an increase in antibiotic resistance, as well as tumors in mice. So what did I do to make sure those ingredients didn't make their way into my body? I keep my teeth and gums healthy by using Young Living’s AromaBright Toothpaste. It gently brushes away daily buildup and helps combat the effects of unsightly staining. It’s tough on buildup, but its smooth, plant-based formula is gentle on teeth and their delicate enamel. You know that furry feeling you get on your teeth just an hour after brushing......that doesn't happen with AromaBright. I have had the best cleanings ever using it and the hygienist has been very pleased. So, make your hygienist pleased! Here is a happy announcement! 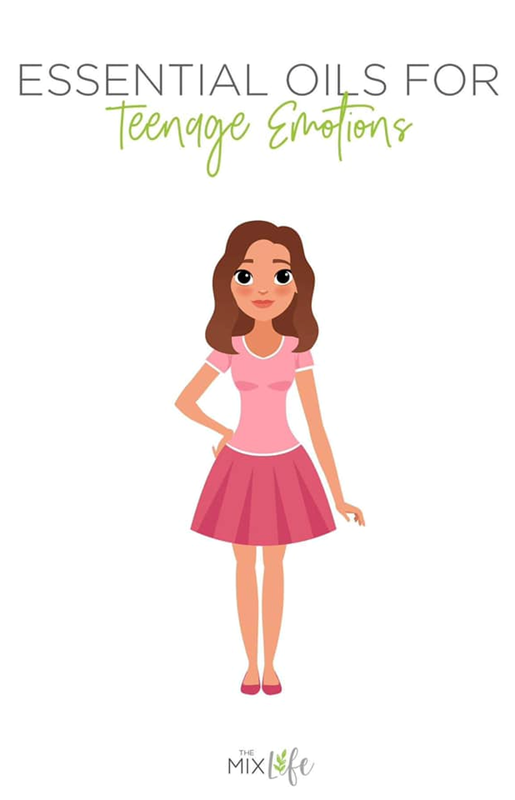 Young Living just released the sweetest surprise this morning! This is the original kit that included: Frankincense, Raven, Citrus Fresh, Stress Away, PanAway, Lavender, Copaiba Vitality, DiGize Vitality, Thieves Vitality, Lemon Vitality, Peppermint Vitality. Along with 2 NingXia Red packets and Thieves Household Cleaner sample packet. AND the Desert Mist diffuser that has 11 light settings and up to 10 hours of diffusing! 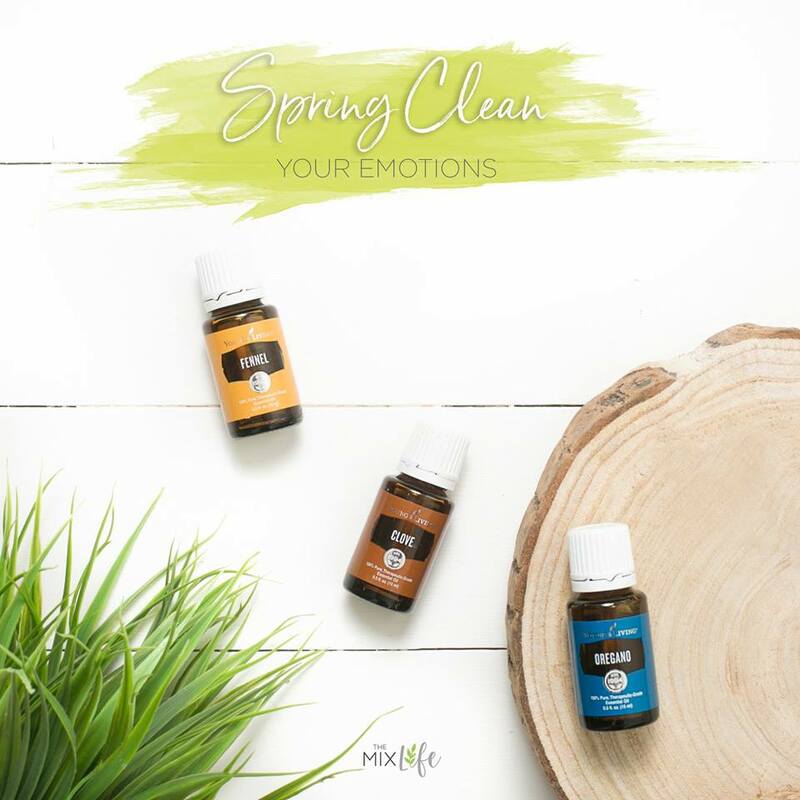 Below is a list that broke this kit down into practical ways you can take and use every item to Spring clean your home and body. 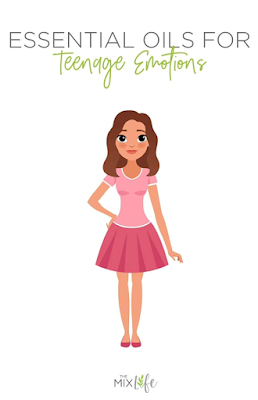 Are you ready to start your healthy lifestyle using essential oils? Contact us using the contact form to the right or on Facebook messenger!! You'll be truly blessed with the start of your new lifestyle. Thieves is getting a lot of attention this month as we share about many of the household uses with the Thieves product line to keep your home clean. Let's not forget to give credit to an old standby, Lemon essential oil, for its effectiveness in helping us stay clean. Germs on a Plane! Forget snakes, oilers, even the likes of Samuel L. Jackson would cringe at the thought of sneezy, sniffling airline passengers...sticky-handed kiddos...and fellow flyers smuggling stinky to-go food on his flight! We've all been there. Looking around at the gate, our imaginations run wild as we begin to wonder how that 15-minutes between this and the last flight could possibly be enough time to totally sanitize that Boeing top to bottom, right? So, what's an oiler to do? 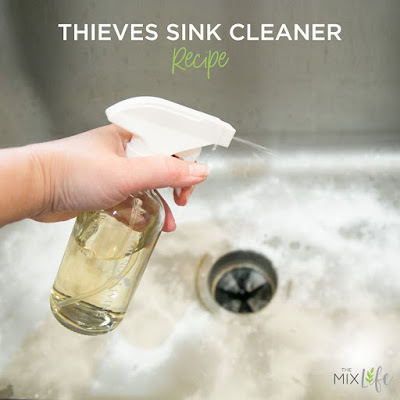 While we always think of Thieves in a pinch when it comes to killing bacteria (I'm sure you've all seen the petri dish tests up against bleach --> BOOM! ), use of the oil or spray may be too strong for some in a confined space shared by many people, so Thieves wipes and Thieves Hand Purifier are great alternatives on a plane. BUT, after many flights, I have found that one of the simplest and most cost-effective single oils (also from the Young Living Premium Starter Kit) is KING OF THE FRIENDLY SKIES! Enter the cleansing action of Lemon oil, the most basic scent we associate with cleanliness, and one most will welcome even on a packed or cranky flight! On a plane, I'm always pack'n travel tissues and a mini 1oz glass spray bottle filled with 10 drops of Lemon YLEO and topped off with water. If you don't have a spray, just bring your Lemon oil and add a drop straight from the bottle to your tissue and get to work before snapping that seatbelt. Wipe down your hand rests and tray table, and even the TV and controller on those longer flights, and heck, do us all a favor and spray down the lavatory, if you must go in there! If it's a long or particularly stinky flight, try a drop of Lemon oil on a diffuser necklace or tissue then tuck it into your top jacket pocket (instant aroma-fashion!) then breathe deeply to enjoy the germ-slaying mini diffusion (is that a word?) before take-off! I always wear a round cotton headband on long flights because it doubles as a scarf that can easily be turned into a diffuser around the neck or over the nose and mouth too (ATV lovers who want to avoid inhaling mud and dust on the trails know what I'm talking about here). If the hacking and stinking hits an all-time high on the plane, just apply a drop of Lemon oil to a tissue and stuff it into your scarf then pull it up over your the bridge of your nose and breathe deeply! Oh, and you may also want to huff Lemon straight from the bottle if there's drama on the plane and you're in a hurry to detach and have peace all the way to your Final Destination (just don't watch that movie before flying). Now, repeat after me: I'm inhaling bright, refreshing, uplifting awesomeness, and exhaling yucky in-flight plane germs, smells and drama! You might also find the uplifting aroma of Lemon oil to provide positive emotional support if you're down about leaving home or not super psyched about a business trip (must not be for Young Living because convention, team meet-ups, and rank retreats are always fun!) or maybe you're just bummed to be returning from your totally dreamy but too-short vacation! Just sniff and go to your happy place, oiler. You got this and all in one little yellow bottle. Once your tray tables are up and you've returned your seat to the upright and most uncomfortable position, repeat all the same tips on the way out of the airport upon arrival making sure to help us out with a Lemon spritz in the closest-to-your-gate bathroom and don't forget a wipe-down of your suitcase handle because, a lot of hands have handled that handle by the time you arrive! Hotels, car rentals and Uber rides.....you get the idea, right! I know that this has happened to me....you know when you enter a room, whether at home or office, and there is just this 'bad' vibe in the room? Sometimes it just hangs in the air like a heavy blanket. Well, Here is a way you can help that atmosphere! Palo Santo Essential Oil! Palo Santo has a very distinct woodsy aroma which is positive and cleansing. It is found in South America and the name literally means, “sacred wood”. Many Incans in South America have used it for years to clear the air of negative energy. That is exactly the bad vibe I was talking about!! The essential oil comes from the same botanical family as Frankincense and Myrrh. And here is the most interesting part of this oil......Young Living only distills the wood of dead, fallen trees! Peru government governs the harvest. You'll find that the live trees may NOT be cut. Only the fallen branches and twigs are harvested. Some say that the wood has to be dead for two years! If you are interested in getting your own bottle of Palo Santo, contact us using the contact form to the right. I didn't have a good replacement for what I had deleted but my skin didn't 'seem' to notice the change. Then I noticed something strange happening. I found that the pores around my nose area had enlarged. WHAT? How and why did that happen? Fast forward three years to today. Several things happened to change my skin care regimen. First I learned from my Young Living Beauty School that after washing your face, you should definitely use toner. Why? Because toner helps to tighten your pores. Well, now, that was an answer. The second thing that changed my regimen was the Savvy Mineral Makeup from Young Living. I was NEVER a user of cream foundation because I hated the way it felt on my skin. When the Savvy Minerals entered the scene, I found that the mineral makeup was so light I didn't even know I had it on! And I loved the way I looked wearing it. But it also presented a new problem for me......how to clean my face with my normal hot water wasn't cutting it. So.....enter in the ART skin care system by Young Living. It doesn't have any of the toxins that I was trying to avoid. The cleanser was perfect for removing the mineral makeup. The toner did its job and my pores around the nose area are back to normal for me! Then the moisturizer......it feels so wonderful on my skin. I often add an essential oil to it as well. Frankincense is a favorite as well as Royal Hawaiian Sandalwood. Both are excellent for skin support which my older skin needed. So, the safe natural solution to remove and cleanse our face at the end of the day is the ART system, in my opinion! It is only 3 steps. The moisturizer is already Infused with essential oils like Frankincense, Royal Hawaiian Sandalwood, Melissa, and Lavender, so I know I am using the best essential oils for my skin. I just sometimes bump it up with a little extra! If you are interested in any products we list on our posts, please contact us using the contact form to the right! We will be happy to help you out! So you remember the movie, The Jerk, starring Steve Martin. One of my favorite clips from that movie is when he runs around screaming "The new phone books are here! The new phone books are here!" He was soooo excited. 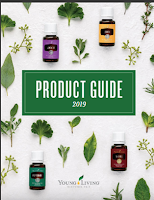 Well, today I'm excited but for the 2019 Young Living Catalog! The new catalogs are here! This catalog will include all the new oils that have been added to our lineup as well as any other new products! You can view it HERE. If you are interested in a catalog of your own, they are $10 including postage from me to you. You thought it would be something else I bet but my favorite 'F' word is Frankincense! From ancient days, Frankincense has been a highly acclaimed oil and good enough to be brought to baby Jesus. You will find yourself feeling calmer and more grounded by simply removing the top of the essential oil bottle and taking a big whiff! Every morning Frank jumps into my moisturizer and give my face the skin support that it craves! Results? Beautiful skin! Want to support normal cell health? Just add a drop of Frank Vitality into your Ningxia Red drink or in a veggie capsule. Who wouldn’t love to support normal cell health with a drop of Frankincense Vitality added to their NingXia Red or in a veggie capsule?! I've also heard that you can diffuse Frankincense while you are studying and then use it on a piece of diffuser jewelry when you take the test you studied for! Result....better recall. Give it a try! If you are interested in trying Frankincense for yourself, contact us using the form to the right and we can order for you. BTW.....it is also one of the oils in our Premium Starter Kit!! For the love of Peppermint! Oh, Peppermint!! When you are diffused, your fresh and minty scent invigorates my mind and body!! You presence on my feet make me energized during my workouts! You are the perfect complement to sugar scrubs. When I diffuse you with Lemon and Lavender, you make seasonal breathing so much easier. Placing you on the back of my neck is not only cooling in the summer but can simmer down a nagging head. And you, Peppermint Vitality, I can always count on you to freshen my breath. You also soothe my stomach after I add you to a glass of water. When I bake, you make anything chocolate taste amazing. We have just touched the surface of you, dear Peppermint!! If you would like to be able to have your own Peppermint, contact us using the contact form to the right! For the love of Thieves! Young Living has a ton of products that I really love from basic essential oils to personal care products that show love to our bodies. And don't forget products to take care of our home; where our hearts reside. 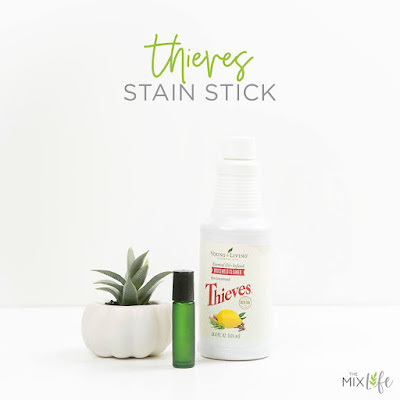 Thieves.......you were one of the first Young Living blends I fell in love with. Your Christmas-like spicy scent comforts me but I know I can diffuse you any time of year and rub you on the hands and feet of all my family members including the kids! And, now I can enjoy you in the handy premade roller bottle as well! I love adding a drop or two of Thieves Vitality to teas, apples, and sweet treats for a boost of wellness. My mother gets a drop in many of her morning protein smoothies to support her immune system. My feet see Thieves often at night and in the morning to boost my immune system. You can also drop some in your Ningxia Red drink to give you a double whammie of immune support. To get Thieves for yourself, contact us using the contact form to the right! With the winter months, you can use all the immune support you can get!! Do you have Winter Face? In the Pacific Northwest, we experience harsh cold weather on a random basis and not for very long. BUT, one thing that winter does for most of us is dry out our skin. Why would that happen in the PNW where we aren't getting the snow and wind like the frigid mid West? Well.......most all of us are using our heating system which naturally dries out the air in your home. For those of you living in the other parts of the country where Old Man Winter is making it miserable, your skin is even drier. Dry skin just looks dull. Have you ever noticed that? It just craves a little moisture! So, let's help it out with a couple of things! First let's talk about a DIY toner. This DIY toner works great to restore the skin’s pH, reduce the appearance of pores, and refreshes tried Winter skin. Plus, it feels amazing on the skin and is free from toxic chemicals!! So that is a win-win! DIY Toner Special thanks to Leslie White of The Mix for sharing. After cleansing face, spray directly on skin or onto cotton round and apply to skin. Let soak in before moisturizing, and enjoy! One of my favorite ways to moisturize my face is to use Jojoba carrier oil and Young Living Frankincense Essential Oil. Why Jojoba? 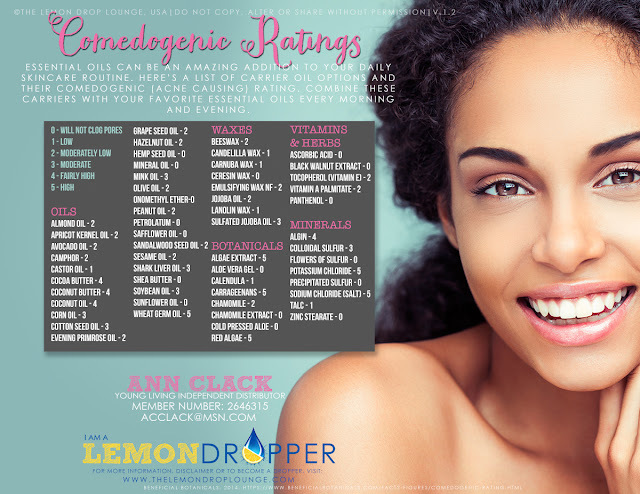 If you look at the Comedogenic chart about carrier oils, it rates them from 1 to 5 with 1 being the best. Jojoba is a 2 so I know that it shouldn't clog my pores on my face. So, every morning I use three to four drops of Jojoba oil and add a drop of the Frankincense. I know what you next question will be! Why Frankincense? Because Frank (my favorite) is superior for your skin support and is wonderful in evening out skin tone. 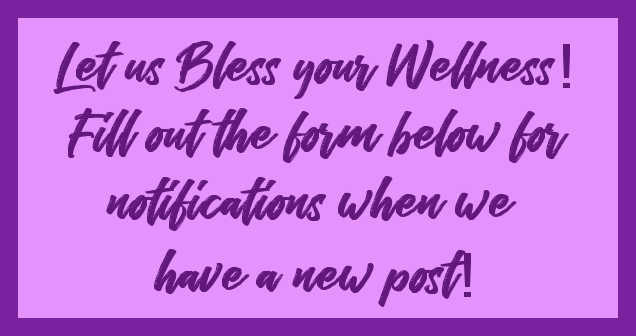 To get any of the oils listed in this post, please contact us using the contact form to the right! We'll get you taken care of!